Enrollment is now open for the 2018-2019 ACEKids Theater Programs! The King advising the Prince in Cinderella at Matthew Paterson. The ACEKids Theater Program rehearses on Mondays at Kent Elementary School and on Tuesdays at Matthew Paterson Elementary School. Cast Members go right from school to the program and finish rehearsal at 5pm. 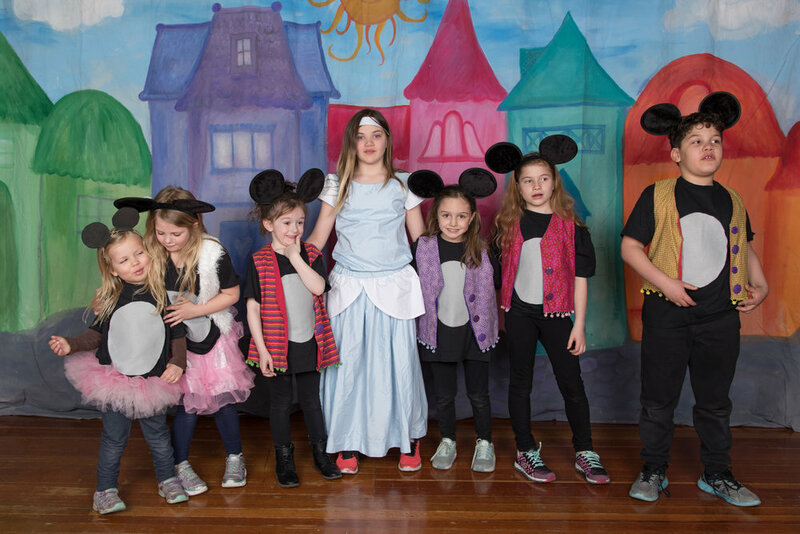 Cinderella and her Mice at Pawling Elementary. The ACEKids Theater Program at Pawling Elementary rehearses on Wednesdays right after school until 5pm. Cast Members go right from school to the program. CLICK HERE for information on this year’s production of Disney’s The Aristocats Kids! Elle Woods and friends in Legally Blonde at Pawling Middle School. The ACEKids Theater Program rehearses on Thursdays at Pawling Middle School. Cast Members meet right after school and rehearse until the 3:45pm late bus. CLICK HERE for information on this year’s production of Roald Dahl’s Willy Wonka Jr.!